Students’ difficulty with algebra has been a national problem for decades. One reason is its late and abrupt introduction in middle and high school, coupled with its seeming disconnectedness to adolescents’ world. The symbolic world of algebra only exacerbates the situation an contributes to our societal dislike of, and admitted incompetence in, algebra. To remedy this situation, NCTM and the CCSSM standards have urged teachers to introduce algebraic habits of mind from the get go. 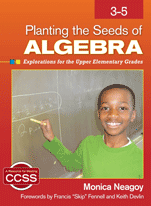 Dr. Neagoy has written this valuable book series, Planting the Seeds of Algebra, to helpteachers and teacher leaders learn to translate this charge into action. 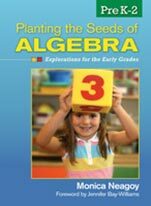 The books take the reader into real classrooms, describe students engaged in important mathematics, model teaching strategies, connect the early mathematics with advanced algebra concepts, and make suggestions for further explorations. Existing research and Dr. Neagoy’s 25 years of experience converge in these books.